It's not quite harvest yet, but a lot of farmers are already busy in the fields...chopping corn silage. There is a pretty small window to get this done. Corn silage needs to be about 60-68 percent moisture, so once it's ready it needs to be chopped pretty quick. This corn is also pretty green, especially compared to the brown corn that is shelled using a combine later in the fall. The corn that's brown has significantly less moisture in it. The red chopper head (lower left) chops up the whole corn stalk and spits it out into the wagon as you can see above. Unlike shelling corn, corn silage involves the entire plant being chopped up. This is great feed for dairy cows! Corn silage is a great energy source, something lactating cows need a lot of. This is what it looks like once it's all chopped up. Cows LOVE corn silage! My brother has been busy in the field chopping silage. My brother checking the corn cobs while taking a break from chopping in the field. Since I can't just drive over and hop in the tractor with him, I drove a few hours to see some amazing folks I call family. We're not actually related, but it doesn't matter. They're awesome. After milking and feeding calves, I got to ride along for a few hours to chop corn silage. What an awesome day!! Very thankful to have the opportunity to do this. Dumping the wagon attached to the chopper into the semi or another wagon. This other wagon was attached to the tractor. This is the semi, which was filled with silage (see above photo) unloading it into the bunker silo. Silage needs to be air tight or mold can grow. The tractor drives over it to compact it and then it is covered with white plastic and tires to hold the plastic down. Thanks to my friend Nicole of Tales of a Kansas Farm Mom for featuring this post as one of her favorites from the October blog party! I love seeing the step by step processes on other farms. 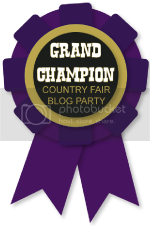 Would you consider joining our Country Fair Blog Party and linking up a few of your posts? We would love to have you! I am so glad you linked up with us! Please plan to join us again next month, too. :) Have a fabulous week! I'd love to! Do you have a blog Facebook page?